I love this pic from flickr. 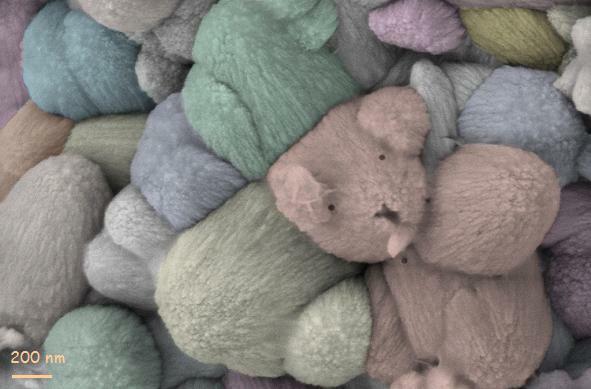 It is a scanning electron microscope image of Zinc Oxide (ZnO) nanostructures (that is, really small ZnO structures) on indium oxide coated glass. I'm not sure if it is a chance photo, or one deliberately created, but either way it is cool! Scanning electron microscopes create images by scanning a surface with a beam of high-energy electrons. The electrons interact with the atoms that make up the sample, and this interaction produces various signals from which a sample's surface topography can be recreated. The interactions between the electron beam and the sample can give off x-rays or light, it can also cause the electron beam to be scattered, and small currents can be generated in the sample. These signals can be read by sensitive equipment which can then reconstruct what the surface looks like. See this "Science as Art" competition for more funky science photos! Here are a few games that are fun and sciencey to keep you sane at work. The New York Times recently published a Distracted Driver game to gauge your distraction while you're texting on the road. The game puts you driving on a road having to negotiate a number of toll booths along the way. The game tests your ability to drive through the correct gates without any distractions, and then it makes you write a couple of text messages whilst still having to negotiate the booths. After you finish the game, you get a comparison of your result with everyone else who has played. I improved the second time I played, my first results are below. I didn't see a grey lady either time! The Dutch national road safety research institute (SWOV). Their publication SWOV Fact sheet: Use of mobile phone while driving was published in 2008 and contains a great deal of up-to-date research. Their conclusion is that the negative effects of mobile phone use whilst driving are caused by both physical and cognitive distraction. Although physical distraction can be reduced through the use of such aids as handsfree phones and speed dialling, cognitive distraction remains the crucial problem. They conclude that handsfree phones do not have significant safety advantages over handheld phones. They also point towards research suggesting that talking on a mobile phone is associated with cognitive distraction that may undermine pedestrian safety. Applied Cognition Laboratory, Department of Psychology, University of Utah - David Strayer has published a wealth of research on the impact of using in-car technologies on driving performance and traffic safety. It is well worth a browse of their published articles. Piracy has a romantic history often associated with walking-the-plank, peg-legs and saying Arrrrr a lot - there is even an international talk like a pirate day on the 19th of September each year. However, modern piracy in Somalia is a deadly game and nothing like the stereotype. Nevertheless, Wired Magazine has had some fun with this and brings us Cut-throat Capitalism in which you are a pirate commander staked with $50,000 from local tribal leaders and other investors, and your job is to guide your pirate crew through raids in and around the Gulf of Aden, attack and capture a ship, and successfully negotiate a ransom. The game is addictive and highly strategic. Initially I kept alienating my crew by being nice in my negotiations, so they eventually deposed me as captain. Then when I was too tough on my hostages, the Navy was called in. Eventually, I was successful in negotiating a $3 million ransom. Piracy off the Somalian coast is seen as a business by those who conduct it, and as such it can be analysed by economists (who, in general, love to think that the world revolves on an economic axis). Wired has taken a look at the economics of piracy and found that the typical payoff for piracy in Somalia today is 100 times what it was in 2005. One of the reasons why it is flourishing today is because it exploits the incentives that drive international maritime trade. Shippers, insurance companies, private security contractors, and national navies stand to lose less by tolerating it rather than attempting to stop it - insurance covers the ransom, ships and goods are not lost and no one dies. The pirates know that they can keep escalating the situation to see just how much the "market" can bear. The negotiation process also involves risk/reward calculations. The Kingdom of Tonga is an archipelago in the South Pacific Ocean comprising 169 islands stretching over a distance of about 800 kilometres. It is the only sovereign monarchy in the Pacific and takes pride in its claim that it was never colonised. I recently spent a wonderful two weeks in Tonga - the islands completely live up to their billing as the Friendly Islands - Captain Cook gave Tonga this moniker after his first visit in 1773 when he was treated to various festivals. It was only later that it was revealed local chiefs wanted to kill Cook but could not agree whether to attack by day or night. Tongan singing - not much science here, but it's beautiful! There are very few places left so get booking if you would like to swim with whales this year. Stay tuned for more on Tonga in upcoming podcasts, in which we will talk about, and experience, the intoxicating drink Kava, the Stone-Henge of the South Pacific, the effects of global warming and rising sea-levels on Tonga, the local animals and more on whaling science and politics. The sporting highlight of 2009 is only hours away. The Ashes cricket series between Australia and England will mean little sleep for cricket-obsessed Aussies, and little work done by the English. Is the winner of The Ashes already pre-determined? Manoj Joshi has shown that the El Nino Southern Oscillation (ENSO) phenomenon has a significant effect on the results of The Ashes cricket series when the series is held in Australia. The Australian Cricket team is more likely to succeed after El Nino years, while the English cricket team does better following La Nina years (the opposite phase). Their study, Could El Niño Southern Oscillation affect the results of the Ashes series in Australia? was published in the journal Weather. These words could easily have come from me, but are actually the words of Rob Eastaway, a cricket-loving mathematician from the UK, and originator of the official International Cricket Council cricket-ratings which rank not only teams, but players within each team. In this podcast, I chat to Rob about how you mathematically rank cricketers. Every cricket season, the TV coverage of cricket becomes more spectacular and technological, with the introduction of microphones to detect the finest of edges through to the keeper, improved abilities to determine the trajectory of a ball once it has left the bowler’s hand, and now even heat sensors to see how the batsman sweats. But the scientific aspects of cricket are not limited to TV companies, with science playing an increasing role in shaping the performance of players, from their general fitness to specific training techniques for both their physical, and possibly more importantly mental, well-being. It is with science that countries are aiming to find the competitive edge. The recent news of the great Indian batsman Sachin Tendulkar surpassing West Indian Brian Lara's record number of test runs has given maths-loving cricket geeks another opportunity to pull out their calculators and Excel spreadsheets. At the time of writing, Tendulkar had scored 12,027 runs across 247 innings, to overtake Lara's 11,953 from 232 innings. After a little investigation, I found that despite his outstanding average of over 54 runs per innings, Tendulkar's most common score in test cricket is ... zero! Even the great Don Bradman scored a duck more times than any other score. And their next most common? One! We look at how are cricket scores are distributed. Do you need to be fit to play cricket? Do the best batsmen in the world really have the ability to predict the type of ball they will receive before it even arrives? And is cricket really more of a mental game than a physical one? In this podcast episode, we talk to Dr Rob Duffield from the School of Human Movement at Charles Sturt University who has found that indeed you really do not need to be as physically fit to play cricket as you do other sports such as football. We also chat to Dr Allistair McRobert from Liverpool John Moores University whose work has shown that the best batsmen can predict to some extent where a bowler will bowl. This work encompasses a look into the subconscious mental game of cricket and how the most successful players are more mentally prepared for the top level than lesser players. More on this topic can also be found in our article The Science of Cricket. Can we predict cricket results using the price of oil? Or is this just bad stats. Also see our article Poor correlations, or why it's not the fault of Aussie cricketers. Good luck to all and come on you Aussies! Do the number of Vampire and Zombie movies released each year depend on whether the US president is Republican or Democrat? Is the winner of the Ashes cricket series between Australia and England dependant on the El Nino effect?